Below is the birthday card that I got for Carleigh from us. It’s always hard to find the right card because hardly any seem appropriate but I managed to find a really good one this year. I also got another card in the mail for Carleigh from my friend Betty. Thank you! Sunday was prolly the hardest day of the weekend because of going to church. Church is always a place were emotions run higher for me. After we took communion I went to the altar and cried. Anthony came up and kneeled with me for a little bit and then I went back to my pew with Lainey. The rest of the day after that was tear free and more light. It was 2 years ago this day that I was in a hospital room hooked up to a Pitocin drip just waiting to meet my little girl. We waited anxiously all day and all night but she wasn’t born until 3:49 am on March 28th. On Monday, Carleigh’s birthday, both Anthony and I were off of work. I had decided that I wanted us to go and do something as a family. When Kyndra went home with my mom and dad after the party of Saturday we thought of just staying home but I decided that we needed to go do something and enjoy ourselves for the day. In preparation for this day, I had Franchesca make me 2 memory boxes that I could fill and present to the Mother Baby Unit at the hospital where Carleigh was born. It also happens to be the place that I work. I also found some bears that I bought and prepared too to donate in her memory. In the memory boxes I put a lavender candle, a disposable camera, a card/bag to put a lock of hair, a card/bag that has a baby ring (with Carleigh’s handprint on the card), and a small heart with a tear drop that can be removed. I figured the families could use this by putting the tear drop with their baby (whether in a casket or urn) and keep the heart with them. We were given something very similar to this and it was nice. Ours was a small heart and a larger heart. The bears I made up to donate. After we got around we went to the hospital. I went to the department where I work first so that I could get my bff Lindsey and have her come with us to take pictures. I forgot my camera in the car so she had to take pics with her cell phone. We stopped by the memorial quilt first and got our picture taken by Carleigh’s name. While we were doing that, the manager of the unit, Mandie, came out and greeted us. I presented her with a box of all the items (which also included 3 Dreams of You memory books I received from Kelly to give to the unit). She asked if I wanted to say hi to all the nurses and of course I wanted to! It was nice to see some of the nurses on the unit. And my nurse, Erin, who was there when Carleigh was born was there! It was good to see her that day. And I saw my postpartum nurse, Michaela, the last time I visited the unit just a couple weeks earlier. After our visit at the hospital we got on the road and headed to the Creation Museum. I’ve been wanting to visit for such a long time now so it was a little extra special to go on Carleigh’s birthday. The museum was so neat and I loved it. We definitely want to go back and take Kyndra with us so we made a point not to see everything. After the museum we stopped at a little candy/ice cream shop that was so quaint and cute called Agalamesis Bro’s! I guess they’ve been around since 1908 and they had some good ice cream. Their red raspberry sorbet was quite good! I also got some vanilla caramels and they were so yummy! After a long day we went home and just rested. Later in the evening I got on the computer and I watched a couple of Carleigh’s videos. I haven’t seen any of them in 2 years. Watching the videos really brought the memories back and I couldn’t believe how much had faded from my memory. I’m so glad we have those videos. What I really wanted to do was just reach out and touch her through the screen. If only that were possible. 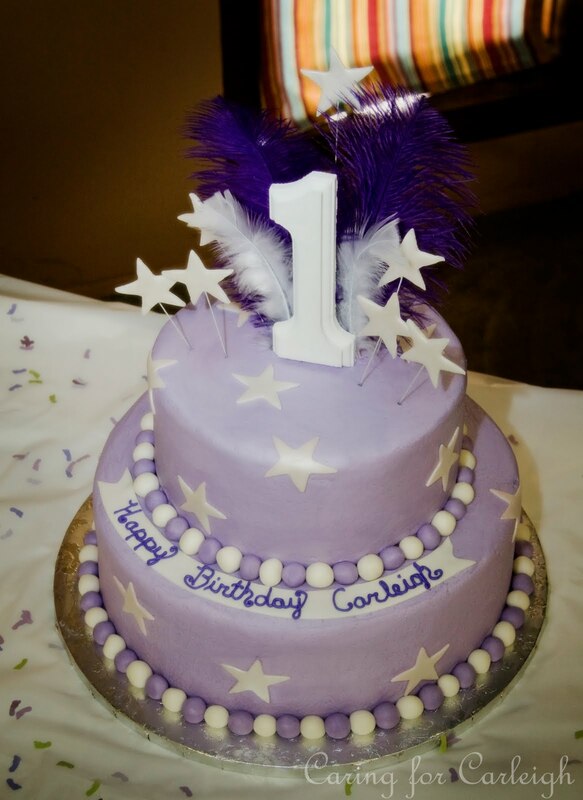 Happy 2nd Birthday in Heaven, Carleigh! You are still so loved and missed every single day! Again, thanks to everyone who showed us in some way they were thinking of us for Carleigh’s birthday. We appreciate it! Here’s just a few things we got for Carleigh. Caroline and her kids-Ridge, Jennifer, Thaniqua, and Carly-always send us so much love. They sent us cards and even made some brownies for her birthday. Thank you! We got some cards from Jenny, Ashley, Sarita, and Bree. Thank you! Our sitter, Ashley, made a neat little bag for our girls to take with us on our visits to the cemetery. They can fill it with gifts or activities to do while we are there. What a neat idea! Thank you! We had a small celebration on Saturday, March 26th for her birthday. I left it an open invitation for family and friends. The people who ended up coming were my parents, my niece, and my best friend, Lindsey, and her family. I ordered a cake-chocolate with buttercream frosting-and it turned out beautifully! The cake lady did an excellent job on it. I even bought a sculpture from The Midnight Orange as a cake topper. It went perfectly with the cake. For lunch we had hamburger and potatoes on the grill. Yummy as always! The kids enjoyed playing together before and after we ate. Then it was time for cake! I put 2 pink candles in the cake and lit them. We sang happy birthday to Carleigh and I let the girls blow out the candles. They were really excited to eat the cake and I must admit so was I! The cake was super good last year (same lady made it) and it was really good again. After we all had our fill of cake we got the balloons around. We decided to do a small release in our backyard and then go out to the cemetery and do one. Lindsey and her family did the one in our backyard with us and then my parents just went out with us to the cemetery. I had the same cards as last year that we wrote on and tied to the balloons. One of the balloons ended up getting stuck on our antenna. Last time I checked it was still there! Oops! It was kinda windy that day so it wasn’t surprising. Out at the cemetery I put a little stone angel by her vase on her headstone. The stone angel was a gift from my friend Amy. I love what it says. I gave Carleigh some new flowers. I had a local flower shop make them but I wasn’t impressed with what they did so I bought my own white flowers and had my mom redo it when they came down before our little party started. It looked so much better after she fixed it! In the vase I also put a little butterfly decoration. The wings glow in the dark. It also came with 2 more. I put one in our backyard in Carleigh’s Corner and I gave one to my mom so she would have one at her house so when we visited we could see it and think of her. We got the rest of the balloons out of the van and let them go. Overall, the day was really good and lighthearted. The celebration was wonderful and we were with people who really cared for us. Kyndra went home with my parents so later I took Lainey up to where I keep Carleigh’s memory chest. I started looking through it and showing her things that belong to her sister. I played a little musical statue that played the tune “I Will Always Love You”. You know, the song that Whitney Houston sings on the movie The Bodyguard? It was so pretty. So I just kept playing that over and over until we were done looking through her chest. So many cherished memories. Congrats to the winners and I hope that you enjoy them! Please email me your addresses at caring4carleigh@yahoo.com. Sorry to those who didn’t win. But don’t worry, if you’ve been around my blog for any length of time you know I love to do giveaways so you can be sure there will be more in the future. Happy 2nd Birthday to my special little baby girl. Mommy misses you and loves you so much!! I hope to share more about her birthday weekend tomorrow along with announcing the winners of the giveaways. Thank you to everyone who showed us in some way that you remembered with us. This is the last birthday giveaway for Carleigh's 2nd birthday. This is one of the newer products from My Forever Child and one that I really like. I know I would love to have a bangle bracelet like this! 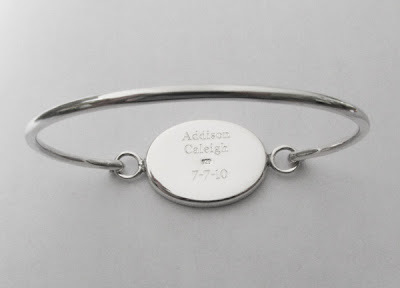 The bracelet is sterling silver and 7.5" circumference. 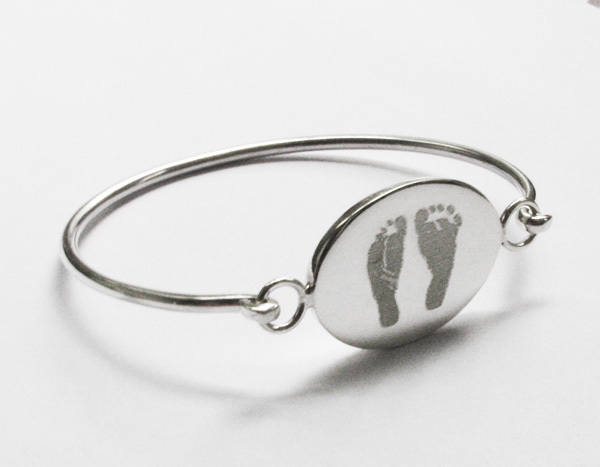 The bracelet can be engraved with your baby's prints. You can choose either 2 feet, 2 hands, or a hand and foot. The back can also be personalized up to 3 lines. To enter the giveaway just leave a comment telling me about your favorite piece of jewelry to wear in remembrance of your baby/babies. Giveaway will remain open until March 26th so this giveaway won't be open for long!!! The second birthday giveaway is just a little something. I have 2 star pocket stones with a butterfly in the center from My Forever Child. I also got myself one and I plan on putting it by Carleigh's headstone at the cemetery. I can't put anything in the ground but one of the things I can do is leave little stuff around her vase on the base of her headstone. To enter this giveaway just leave a comment! This giveaway will remain open until Saturday, March 26th. My favorite hymn to sing is the hymn It Is Well with My Soul. I've loved this hymn for as long as I can remember, but it took on new meaning after Carleigh. I now cannot sing this song without crying. Do you know the story behind this hymn? It's tragic, yet beautiful. "This hymn was written by a Chicago lawyer, Horatio G. Spafford. You might think to write a worship song titled, 'It is well with my soul', you would indeed have to be a rich, successful Chicago lawyer. But the words, "When sorrows like sea billows roll ... It is well with my soul”, were not written during the happiest period of Spafford's life. On the contrary, they came from a man who had suffered almost unimaginable personal tragedy. Horatio G. Spafford and his wife, Anna, were pretty well-known in 1860’s Chicago. And this was not just because of Horatio's legal career and business endeavors. The Spaffords were also prominent supporters and close friends of D.L. Moody, the famous preacher. In 1870, however, things started to go wrong. The Spaffords' only son was killed by scarlet fever at the age of four. A year later, it was fire rather than fever that struck. Horatio had invested heavily in real estate on the shores of Lake Michigan. In 1871, every one of these holdings was wiped out by the great Chicago Fire. On November 2nd 1873, the 'Ville de Havre' had collided with 'The Lochearn', an English vessel. It sank in only 12 minutes, claiming the lives of 226 people. Anna Spafford had stood bravely on the deck, with her daughters Annie, Maggie, Bessie and Tanetta clinging desperately to her. Her last memory had been of her baby being torn violently from her arms by the force of the waters. Anna was only saved from the fate of her daughters by a plank which floated beneath her unconscious body and propped her up. When the survivors of the wreck had been rescued, Mrs. Spafford's first reaction was one of complete despair. Then she heard a voice speak to her, "You were spared for a purpose." And she immediately recalled the words of a friend, "It's easy to be grateful and good when you have so much, but take care that you are not a fair-weather friend to God." Upon hearing the terrible news, Horatio Spafford boarded the next ship out of New York to join his bereaved wife. Bertha Spafford (the fifth daughter of Horatio and Anna born later) explained that during her father's voyage, the captain of the ship had called him to the bridge. "A careful reckoning has been made", he said, "and I believe we are now passing the place where the de Havre was wrecked. The water is three miles deep." Horatio then returned to his cabin and penned the lyrics of his great hymn." Horatio and his wife later had 3 more children-2 daughters and a son who died in infancy. They moved to Jerusalem and founded a mission that served the poor. Can you imagine going through everything he went through and still saying, "It is well."? Today I stopped by our local Christian book store to see if I could find something to put in a couple memory boxes. I was glancing at the wall where they have different pieces of art when I saw the hymn in a frame among other hymns. I read over the words and my eyes filled with tears which threatened to spill over. I kept myself together as I didn't want to lose it in the store. It's really quiet in there. The third verse for some reason is missing but it didn't matter. I had to buy it. So it came home with me and I plan on hanging it next to a rustic cross and near a framed drawing of Jesus we have. It's less than a week until Carleigh's 2nd birthday. My emotions have been much more in check this year than last year. I wasn't sure what to expect and still don't. But as I read the words to my favorite hymn I am reminded that while my heart is still broken it is well, yes, it is well with my soul. My little girl's birthday is next Monday so I am holding a few giveaways this week in honor of her birthday. Birthday giveaway #1 is for a sculpture from The Midnight Orange. Dana, the artist, makes wonderful pieces for grieving families. The sculpture I'm giving away is called Go Tell Mommy I'm Okay. 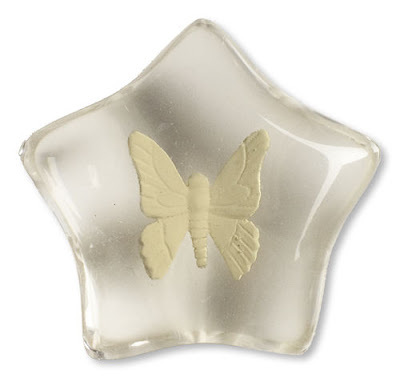 The baby is sending a message of comfort to mommy through a butterfly. To enter the giveaway just leave a comment telling how you think your baby/babies send you messages of comfort. The giveaway will remain open until Saturday, March 26th. I have set the online auction for Sufficient Grace Ministries for April 6th-8th. The auction will run on my Caring for Carleigh FB page. I will have an album set up with all of the items up for bid and on those days you can post your bid in a comment. I can't wait for it and I hope that it raises a lot of money for Sufficient Grace! Thanks to those who have donated items already! Have you heard of the ministry Rows for Remembrance? The ministry was created by Shaina for families who have suffered a miscarriage or infant loss. She brings parents a way to remember their babies in a very different way. Click over to her site to check it out! I actually am sending her some yarn for Carleigh. From a Lullaby to Goodbye has a new page where you can share your child. It's just a little space where you can share with others about your child. I thought I would share because I know I like to share my children with others. Ok, I wasn't planning on walking for March for Babies this year but then I got a team captain packet in the mail. I thought what the heck and decided to go ahead and do it. So I freed up my weekend since I was supposed to work that weekend and voila-Team Caring for Carleigh is up and running and ready to go! And my own personal page can be accessed through the banner above. Those who joined us in walking last year are welcome to join us again and if you didn't walk with us before then we encourage you to walk this year! Our walk will be on May 7th in Findlay, OH. If you're interested then just send me an email at caring4carleigh@yahoo.com and I'll walk you through the steps on how to register and join our team online (unless you know how to do it yourself). Anybody else walking this year? If so, leave the link to your personal page and I'll donate a couple dollars to your walk. I was also planning on getting tshirts again for our team and was thinking how nice it would be to have the names of babies gone too soon on the back. I've seen a couple other moms do this and I always loved that my baby was included on their shirt. So, if you would like your baby's name included on the shirt please leave their name in a comment. I will prolly only do first names though so that there is more room on the shirt. It would be an honor to walk with your babies' names on our shirts. Thanks to everyone who has responded to my event on FB for Carleigh's birthday saying that they would remember her in some way on the 28th. It's much appreciated! And for those family and friends who want to join us on the 26th for a small party it is gonna be at our house at 1pm. Anyone who wants to join us is welcome! We'll have some food and cake and then go to the cemetery for a balloon release. We hope that you will join us if you are able! Speaking of cake, the cake is ordered and I can't wait to see it. I even ordered something today from The Midnight Orange to go on top of it. When I saw it I just had to buy it! And speaking of The Midnight Orange, I also bought something to give away for Carleigh's birthday. :) I'm looking into a few more things to also give away. Of course, you can be sure I'll also have something from My Forever Child. On the day of Carleigh's birthday, which is the 28th, I don't have to work since I work the weekend so I also had Anthony take the day off. We're gonna go do something together for the day. We're either gonna go to the Newport Aquarium or to the Creation Museum. We haven't decided which one yet. But also on that day before we head off to do whatever we choose to do we'll drop off 2 memory boxes to the hospital where I work. Franchesca is making up the actual memory boxes for me. I know I liked Carleigh's star memory box she made for me so it just seemed right. So far I've bought a disposable camera and a small lavender candle to go in each. Any recommendations on what else to put in there? Was there something you got in a memory box that was helpful? Was there something you wished you would've got? You'd think I would know but we didn't receive a memory box from the hospital because I knew that I would get one made later. They did offer one though. I just wanted to share a little something that was shared with me recently. I received a message from a lady named Phyllis who used to be a friend of mine on Cafemom around the time when Carleigh was still with me. She said that she shared about me with her daughter. Through our journey she also found out about NILMDTS and she talked about it with her friend who was a photographer. From their conversation, the friend decided to volunteer for NILMDTS. Then Phyllis' daughter's friend Lacy had a son, Kolton, with anencephaly on November 23, 2010. Phyllis' friend is the photographer who ended up taking their NILMDTS photos. Phyllis thought that I would like to know that telling my story on CM ultimately helped Lacy because otherwise, there would not have been a NILMDTS photographer for her. Just a wow moment for me and proof that Carleigh's story did make an impact. And I'm so glad that Lacy was able to have NILMDTS photographer because those photos are a priceless treasure! Thank you, Phyllis, for sharing this with me especially as we draw closer to Carleigh's 2nd birthday. I just love hearing things like this. If you've been around these parts for a while you may know that I'm a big supporter of Sufficient Grace Ministries. Kelly, who founded the ministry, even graced me with the honor of being a board member. But being that I live a couple hours away from the rest of the SGM crew it kinda limits what I can do with the ministry. One thing I can do for them is fundraisers. If you aren't aware, Sufficient Grace Ministries offers their products and services for free to all bereaved parents. Because of this, the ministry holds fundraisers so that they can keep offering these services for free and not have to charge parents for them. I know many families out there who have been on the receiving end of this ministry, including myself. Recently I have taken part in a couple of online auctions and was inspired by them to hold my own online auction to benefit Sufficient Grace Ministries. Right now I am gathering items to auction off and have a good number of items so far. I am also looking for individuals and/or businesses/shops to donate items if they are willing. It could be something little or something big. Anything is appreciated!! If you are interested in helping out please send me an email at caring4carleigh@yahoo.com. I plan on holding the auction some time in the beginning of April. A definite date(s) has not been set yet but I will announce it as soon as it is. Thank you to those who have already helped out!! Right now I am in the midst of planning what to do. I've decided to have a little get together at our house on the 26th, which is a Saturday. This will be the day when family and friends can gather with us to remember her and celebrate her life. We'll have food and cake at our house and then go release balloons at the cemetery. I hope I'm not setting myself up for too big a disappointment like last year. But like my hubby said then, this isn't about them. It's about her. But still.....we all know how it feels when people choose to not acknowledge or take the time to remember our babies. I am glad to know that people who say they won't be able to be there on that day are gonna remember her in some way. I appreciate that. After reading my friend Trisha's post about her son Nathan's 3rd birthday, I've decided I'd like to do something a little different than I had planned for Carleigh's actual birthday on the 28th. I have the day off of work and was just gonna spend the day at home with the girls and then make an angel food cake for later that evening when Anthony got home from work and then visit the cemetery later. But now I am thinking that it would be great for Anthony to take the day off of work and to go do something as a family. But I still wanna make the angel food cake because that's just yummy goodness. Of course, I gotta run this by Anthony but I hope that he'll agree to it. I have decided what Carleigh's cake is going to be like for on the 26th and it is gonna be amazing! I can't wait to see what it's gonna look like in person. So far this year has been better emotionally leading up to her birthday but there's still plenty of time for that to change. Maybe the reason for this is I have less time to just sit and dwell on it all with 2 little girls to look after. They keep me pretty busy! Usually my toughest moments are in the car driving and a song comes on that just gets the emotions stirring. I'm glad for those moments though and the release that it brings. Sometimes it's nice to just let it out. It's hard for me to believe that she'd be almost 2 years old. Her absence is still felt. Many times I see my girls together and I think about the little girl that is missing from the picture. I wonder what exactly she would look like and how her personality would be. Would she be a mommy's girl too or would she dote on daddy? I do believe I get glimpses of her through her sisters but it's still hard to imagine. God, if You could would You send me a dream and let me know a little more about her? That would be a wonderful birthday present. Today I had someone at work ask me the dreaded question of how many children I had. When she asked it I just let out this big exasperated sigh. It's such a loaded question and I hate having to answer it sometimes and on this day I just didn't want to have to answer it. But I did and I left her out. WHAT!? I left her out!? How could I do that!? I admit I wasn't really thinking and after I left her out I immediately regretted it and just felt guilty. But is it so bad not wanting to get into it all? I know it's ok and she isn't upset about it but this was the first time I have ever left her out. Almost everyone in my department knows what happened because they were there through it all so I guess I just didn't feel like explaining it to someone who prolly wasn't gonna be around much longer. Why must this question always leave me at a loss for words? I know what my heart wants to say but sometimes it can be so hard to speak the words. Almost 2 years ago my daughter was born and almost a week later my milk came in. It was right before her visitations and service. I pumped and stored my milk for 3 weeks hoping to give it to someone who needed it and would use it. I ended up giving it to my cousin who had her baby around 2 months later. I was happy that she would be able to use it for her baby. I had assumed all this time that she had given it to her baby. I found out today that after I gave it to her she threw the breast milk away. She may have used a little bit of it but SHE THREW IT AWAY!!! I am so upset over this. This really hurts me that she did this. If she didn't want the milk all she had to do was tell me and I would've donated it to a milk bank or gave it to someone else who wanted it. This was the milk my body made that was supposed to nourish my daughter but instead it was thrown in the trash. It makes me sick. It feels like she has disrespected me and even worse, my daughter. I don't plan on bringing this up to her because I don't want to end up hurting her feelings despite that she has hurt mine. And normally I wouldn't post things like this that she could very well end up reading but I figure if she finds out I know this way I don't really care. I just needed to vent about it and this is my space to do so. On a happier note, I remembered I never shared the lovely heart pin that Kristin sent me for Carleigh. It's such a lovely pin and it makes me happy that she thought of us. Thanks Kristin! The heart kinda reminds me of what my heart is like now-a joyful and mournful heart in one. I guess I figured out what I am going to do for Carleigh's 2nd birthday coming up. On the 26th, which is a Saturday, we'll have a small party (if that's what you wanna call it) at our house with some cake and then go release balloons at the cemetery. I decided to do something this day in case any of our family and/or friends wanted to join us. Then on the 28th, we'll do something just as a family. I'm not sure what yet but I'm sure we'll go out to the cemetery at some point. Now I just need to decide what kind of cake I want to get. I don't want it to be as big as last year's cake because honestly, that would be a whole lot of cake left over! But I sure did love the cake and I do want it to be beautiful again but just not as big. I for sure want to order it from the same place because the cake was soooooo good. One of the best cakes I've ever had. So I'll have to be looking online for some cake ideas. Plus I'll need to get some balloons ordered. I think I'll order them from the same place I did last year because the people were so very nice. So, if you are interested in joining us on the 26th just send me an email and let me know.